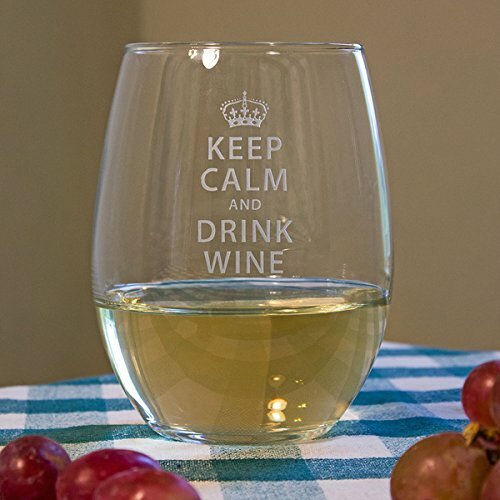 Susquehanna ‘KEEP CALM and DRINK WINE’ Etched Clear Stemless Glass (Set of 4) – My Home Wine Bar ! Amazon Price: $56.26 (as of January 30, 2019 11:52 pm - Details). Product prices and availability are accurate as of the date/time indicated and are subject to change. Any price and availability information displayed on the Amazon site at the time of purchase will apply to the purchase of this product. Don’t Panic ! – Accent your favorite wine with this set of Susquehanna 21 ounce KEEP CALM and DRINK WINE Etched Clear Stemless Glasses (Set of 4). Each 21-ounce glass features a sand etched design.